The ongoing conflict in Syria has always been a proxy conflict aimed at Iran, as well as nearby Russia, and more distant China. As far back as 2007, two-time Pulitzer Prize winner Seymour Hersh warned in his 9-page New Yorker report “The Redirection Is the Administration’s new policy benefitting our enemies in the war on terrorism?” that a region-wide sectarian war was being engineered by the US, Saudi Arabia, and Israel – all of whom were working in concert even in 2007, to build the foundation of a sectarian militant army. "…the most salient advantage this option has over that of an American air campaign is the possibility that Israel alone would be blamed for the attack. If this proves true, then the United States might not have to deal with Iranian retaliation or the diplomatic backlash that would accompany an American military operation against Iran. It could allow Washington to have its cake (delay Iran’s acquisition of a nuclear weapon) and eat it, too (avoid undermining many other U.S. regional diplomatic initiatives)." 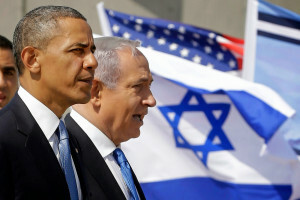 "A row between the US and Benjamin Netanyahu has deepened, with the Israeli leader accusing America and others of “giving up” on trying to stop Iran obtaining nuclear weapons. The US secretary of state questioned Mr Netanyahu’s judgement on the issue." "As the conclusion discusses, an air campaign against Iran’s nuclear sites would likely have to be coupled with a containment strategy—before, during, and especially after the strikes. Containment would be necessary to hinder Iran from reconstituting its nuclear program, prevent it from retaliating against the United States and its allies, and to deal with Iran’s support for violent extremist groups and other anti-status quo activities." "…even if U.S. support for an insurgency failed to produce the overthrow of the regime, it could still place Tehran under considerable pressure, which might either prevent the regime from making mischief abroad or persuade it to make concessions on issues of importance to the United States (such as its nuclear program and support to Hamas, Hizballah, and the Taliban). Indeed, Washington might decide that this second objective is a more compelling rationale for supporting an insurgency than the (much less likely) goal of actually overthrowing the regime." "Insurgencies take a long time to succeed, when they succeed at all. It takes time for insurgents to identify leaders and recruit personnel, establish bases and gather equipment, and learn tactics and proficiency with weapons. It takes even longer to win popular support, erode the morale of the government’s armed forces, and then undermine the government’s legitimacy." "The Central Intelligence Agency (CIA) could take care of most of the supplies and training for these groups, as it has for decades all over the world. However, Washington would need to decide whether to provide the groups with direct military assistance…"
"To protect neighboring countries providing sanctuary to the insurgents. Any insurgency against the Iranian regime would need a safe haven and conduit for arms and other supplies through one or more of Iran’s neighbors."